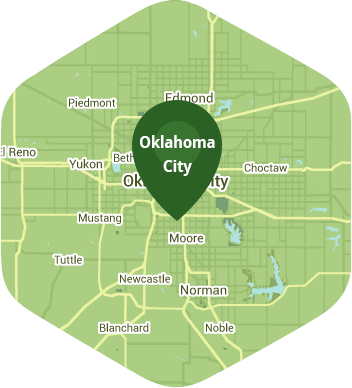 Book a skilled lawn pro in Norman. Backed by a total satisfaction guarantee and amazing customer support. The small town of Norman is a great place to live in and is full of so many things for you to do. This town's majestic beauty is further brought about by all of the museums, theaters, and great parks that can be found here. And there are always those Sooners games to look forward to so you can cheer on your state's beloved team. With so many great things to do in Norman why would you be content with spending your weekends sweating behind your lawn mower? Go out there and enjoy your Saturday, and let Lawn Love's lawn mowing service save the day. We got independent lawn pros who are experts at mowing lawns. With us on the job you can store that lawn mower away, and get the perfectly cut lawn you've always wanted without having to do any work. With our app and website, you can schedule your lawn mowing service quickly and easily, and have one of our guys come over to work on your lawn. We are a fully bonded and insured company, so you can rest assured that you will be getting the absolute best service for your money. Give our lawn mowing service a try by calling at 405-926-8318, or ask for a free online quote. Brendan is also so good and provides great service. My yard looks fantastic every time! Brendan has been our lawn professional for the past year and he's great! It's a pleasure having him mow our lawn! Mr. Jones did an excellent job and kept us well informed. We were very pleased at how the yard looked and the prompt service after the weather delays. We plan to book again. Always recommend to my friends and family!! Looks SO GREAT. Thank you! They did a great job. Thanks so much. The yard is the cleanest it has been since we first moved in. The service pro worked hard to remove all the leaves and other debris. I’m very impressed by lawn love! I will be using your service next year and I promote your service to anyone that uses a lawn service. Very good job all year. Cory did a great job!! Never disappoints!! LawnLove has taken such great care of me over this growing season! Thank you so much for your hard work. My yard looks gorgeous every time! You all have done a great job. Always letting me know what’s going on! As usual.. awesome work and great hospitality. Couldn't ask for more. My yard always looks spectacular!!!! Great job every time! I will definitely contact Lawn Love service again for assistance with my Lawn. Great Job by Jarrod. Rated 4.75 / 5 stars in 3,720 Norman customer reviews. There won't be any rain in Norman today, which means you'll probably have to water your lawn. Dusk and dawn are the best times to water your lawn (the sun will rise at 6:46 AM and set at 8:10 PM today in Norman). Here are some average lawn care prices for homes in Norman. Average lawn size 3,866 sq. ft.